Put the world's smallest and largest birds into a fight ring and neither might win. A hummingbird is too fast for a giant ostrich to clobber, and an ostrich is too big for a tiny hummingbird to do anything but annoy. Although these two birds differ vastly in the way they look and live, they have notable similarities you may have never noticed. Imagine you're in a garden and along comes what you think is a large bee flitting from flower to flower. It's possible that what you thought was bee is actually a hummingbird flapping its wings at an amazing rate of speed. National Geographic calls hummingbirds "marvels of micro-engineering." North American hummingbirds, for instance, beat their wings 53 times per second when flying normally. Cuba's bee hummingbird, the word's smallest bird, is only 5.7 cm (2.25 inches) long. Meet an ostrich in person, and its 2.4-meter (8-foot) height may alarm you. Because adult ostriches can weigh about 156 kilograms (345 pounds), you probably don't want one to sit on you. This giant bird's kick is so powerful that an ostrich defending itself could kill a lion. Ostriches and hummingbirds both move remarkably fast. An ostrich may not fly, but it can run at speeds of up to 65 kilometers (40 miles) per hour. In addition to generating lightning-fast wing beats, hummingbirds can also sail through the air at breakneck velocities. For instance, the Anna's hummingbird dives from high altitudes at up to 27.3 meters (90 feet) per second. When a hummingbird breaks out of a dive, it experiences a force of almost 10 Gs, or 10 times the force of gravity. Like all birds, hummingbirds and ostriches produce eggs that protect developing embryos. Microscopic holes in an egg allow oxygen to nourish the embryo inside, even if the egg weighs only 0.00028 kilograms (0.01 ounces), or the size egg a small hummingbird lays. Ostriches, on the other hand, lay gigantic eggs that may weigh up to 1.59 kilograms (3.5 pounds). According to Jerry Hopkins, author of "Extreme Cuisine: The Weird and Wonderful Foods That People Eat," ostriches are not cowardly, as some people may think. In fact, they can exhibit aggressive behavior. An ostrich once critically injured singer Johnny Cash after he threatened the bird. Even though hummingbirds are tiny, they are territorial when they are near feeding areas. A lone hummingbird, for instance, may try to defend a bird feeder designed to supply several other birds. If an ostrich and a hummingbird went to dinner, they might find a few foods they both liked. Ostriches eat small invertebrates, as well as seeds and insects. Because hummingbirds have a high metabolic rate, they eat almost continuously. 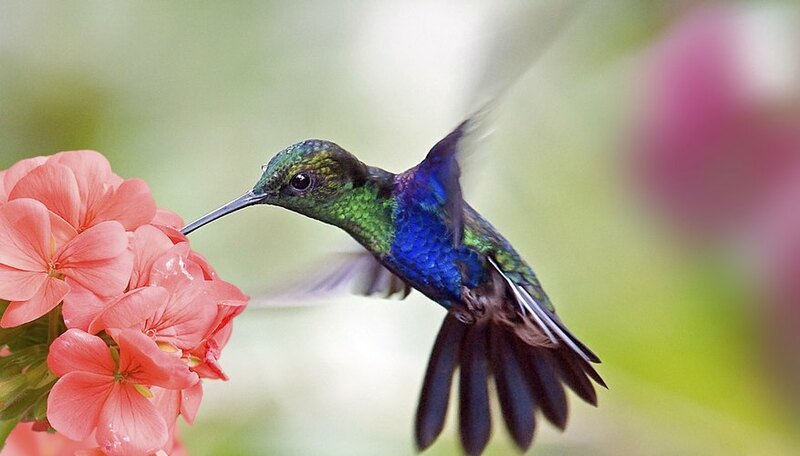 Although hummingbirds birds enjoy nectar, like ostriches, hummingbirds also eat insects. Hummingbirds, one of the few birds that prefers sweet foods, can even identify different types of sugars. 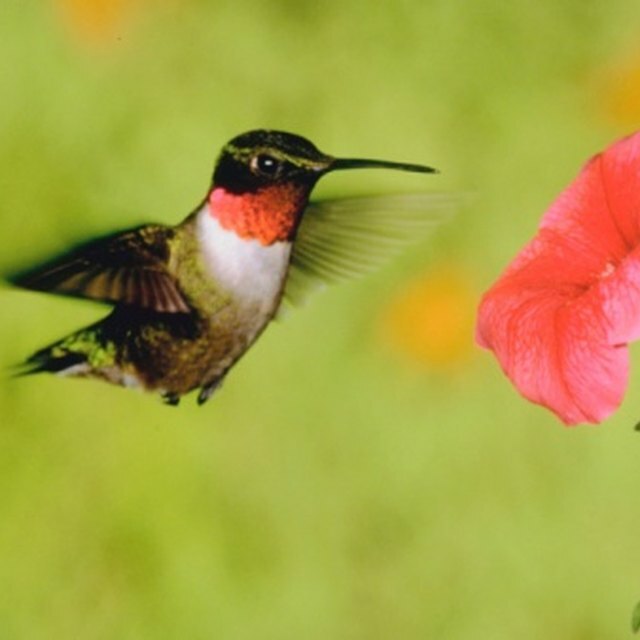 National Geographic: World's Fastest Flyer Is a Hummingbird? What Birds Are Penguins Most Related To? Lee, Kevin. "Ostrich & Hummingbird Similarities." Sciencing, https://sciencing.com/ostrich-hummingbird-similarities-8516515.html. 25 April 2017.